Who do think will win the 2018 World Pool Masters? How long does your American Pool Cue tip last before you change it? Who do think will win the 2017 World Pool Series Event 1? Cheqio - penny for your thoughts? 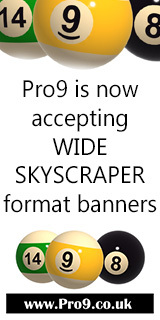 When viewing Pro9, are you using a Desktop/Laptop Computer, or a Smartphone? 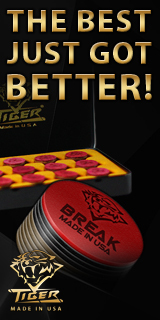 Which is your favourite Tiger cue tip? How many pool cues do you own (including break and jump cues, but not snooker etc)? Will you upgrade to KAMUI CLEAR next time you buy a KAMUI Cue Tip? Page took 0.023848 seconds to load.